We have marked the top most position among the most reliable Scalp Vein Set manufacturers and suppliers in India. The simple design of the Disposable Scalp Vein Set is highly effective in providing quick venous access and comfort during infusion. The butterfly wings are available in different colors that help in identification of the sizes and the design of the wings also facilitate in better fixation. 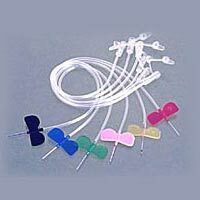 Customers are also facilitated with the availability of the Scalp Vein Blood Sets in different sizes that range from 20G to 24G.